These Magnetic Bookmarks from Controlling My Chaos are so easy to make (my son gave them to his class a few years ago). You just print her FREE designs onto glossy photo paper, score and fold them. Then you attach a small piece of flat magnet (I reused the ones from the fridge from realtors and other salespeople), and voila! Jill has designs for Valentine’s Day, boys, girls, and more. They’re so fun! 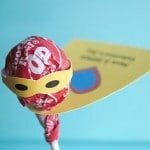 I saw these Superhero Valentine Lollipops in Family Fun Magazine as well as on ZakkaLife. Since we love superheroes at our house, my girls love this idea. It’s just a matter of cutting paper scraps into freehand pieces, or you can print Jessica’s templates onto white cardstock. 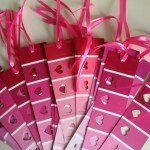 These Valentine Bookmarks from Lu Bird Baby made from paint chips are so cute! I’m not comfortable with walking into a store and picking up 25 at once, but I could see taking a few each time I go to Walmart over the next few weeks. Use a heart punch (or borrow one if you don’t own one) and add a ribbon. Easy Peasy! 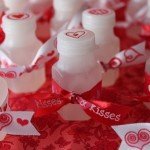 Another great non-candy Valentine option is bubbles! Dollar Store Crafts made these Valentine Bubbles for less than $5 of supplies. If you already had stickers and ribbon on hand, it would cost even less. 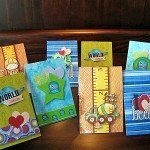 What are your favorite frugal Valentines for kids? If you’re on Pinterest, you can see more of my Valentine favorites by following me. 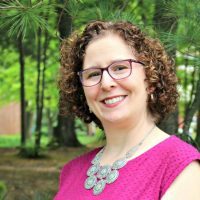 This post is linked up to Frugal Friday at Life as Mom. This is one of my favorite ideas. I found it a few years ago–it may have even been you that shared it? Ritz Camera does prints for $0.06 on Tues and Wed and then grab a bag of lollipops–SOOOO cute! Sooo cheap.